On October 16th, 2009 the Council on Foreign Relations, a powerful Globalist think tank met in New York to discuss policy advisement measures on the Government’s H1N1 program. The minutes of the symposium reveal various techniques employed behind the scenes to influence the ‘herd’; including using artificial scarcity to increase demand, blatant fear mongering & counter measures to quell the “anti-vaccine movement”. The program was clearly in disarray. “I think we’re all aware the anti vaccine movement is having a field-day on the internet and on media outlets like Fox News (chuckle heard) causing reductions in vaccine uptake and it appears to be a pretty unholy alliance of the ultra right & ultra left working together in a sort of Hitler-Stalin pact (hysterical laughter). I’m not sure we’re countering these people very well. One of the sound bytes they agreed upon utilizing was the ‘Mercury in Tuna vs Mercury in the Shot’ argument. Within days mainstream media around the world were pumping out headlines debunking vaccine resisters for their so called ‘inconsistencies’ on this point. The hook swayed some of those still sitting on the fence to go ahead and get the shot. Many now regret that decision. Mercury contained in tuna does not affect the body in the same manner as does Thimerosal. Heavy metals which we ingest are mostly effectively sequestered & chelated by the body, passing through us without rendering serious harm. “The methylmercury in fish is mostly bound up. I mean if it weren’t, the fish would die. The fish protects itself because it’s slowly exposed to this methylmercury as it eats smaller fish, etc., and the fish’s body makes compounds to protect it. If it’s an ocean fish, it’s bringing in lots of selenium. There’s much more selenium in the ocean than there is mercury, and selenium is the big neutralizer of mercury toxicity in the environment. So when you eat fish, you are not eating methylmercury. You’re eating methylmercury attached to a protein in the fish because it’s too reactive to be in a biological system where there’s proteins and sulfur compounds or compounds that bind mercury, and just be floating around free. Thimerosal Mercury contained in vaccines is injected into deep muscle tissue. Ethel Mercury is a highly refined devastatingly powerful neurotoxin linked to psychological, neurological & immunological problems: nervous system damage, kidney disease, birth defects, dental problems, mood swings, mental changes, hallucinations, memory loss, nerve damage, inability to concentrate, tremors, loss of dermal sensitivity, symptoms of slurred speech and, in rare cases, even paralysis and death. 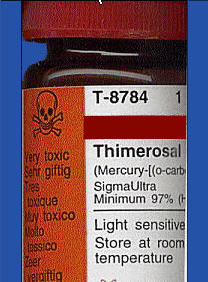 Thimerosal Mercury bypasses this natural barrier. It then gets absorbed into the brain converting to Mercury Ion. It will linger there for decades upwards of a lifetime; causing prolonged auto-immune disorders while weakening the overall immune system. Mercury fillings exacerbate these areas inhibiting the Thyroid Gland’s ability to regulate free radicals; crippling the body’s metabolic structure – Endocrine, Nervous, Digestive, Skeletal & Circulatory system functioning. Mike Wagnitz, PhD. discusses levels and types of mercury toxicity in vaccines. Studies also reveal that the level of mercury in the umbilical cord blood of newborns is 1.7 times higher than the mercury level in their mother’s blood. Pregnant women are at a heightened risk of adverse reactions to vaccines. Thimerosal Mercury is added to the H1N1 series ostensibly to sterilize the giant multi-dose vats containing the serum. Mercury is such a fine neuro-toxin it gets absorbed into the Placenta thereby exposing the fetus, regardless of which trimester, to the potential of serious trauma & long-term side effects including asthma, allergies, chronic fatigue, autism, schizophrenia; unfortunately in certain cases, even death.